Smitty: Well, it is certainly my wonderful pleasure to finally welcome an incredible sax player to JazzMonthly.com. She has amazing “sax stamina” and incredible “saxability,” and I must tell you, her latest CD is all of that. It is called Change of Mood. 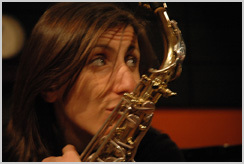 She’s the toast and the most of all Italy, one of the strongest sax players in the world and her music will truly ignite you! Please welcome Black Saint recording artist Ms. Carla Marciano. Carla, how ya doin’? Carla Marciano (CM): I’m really fine, thank you. Smitty: Great. Well, it is certainly wonderful to finally talk with you at JazzMonthly.com. CM: It’s a pleasure for me as well to talk to you. Thank you for doing this interview. Smitty: Oh yes, you are so welcome, it’s my pleasure. Now, I must tell you that I certainly loved Trane’s Groove and A Strange Day, but Change of Mood has just won my heart. CM: What can I say? I’m speechless. And of course I’m really glad to hear that you really appreciated my last two CDs. Smitty: Yes. Now, we met finally on Broadway in New York and it was such a pleasure to meet you and your band. CM: It was such a great pleasure for us as well to meet you in New York and I was really honored that you flew from Houston to New York to be at our concert and listen to our music. You were so kind to all of us and your attitude towards us showed me that you are a great friend of ours, so we really liked that. Thank you. Smitty: Yes. Thank you very much. It was such a thrill for me. I wanted to say that D. J. Fazio could not be here with me today, but she sends her warmest regards to you and the band. CM: D. J. Fazio, yes! I’m so happy to hear that she’s sending us her regards. She was with you as well in New York and it was a great pleasure to meet her there. Please give my regards to her. She was so kind to fly together with you because I think she comes from Canada and it was really great to join us in New York, so thanks again for meeting us there in New York. We have all the gifts you gave us, your souvenirs, and when I look at them I remember the days spent together. I’ve got that small saxophone that you gave me to hold my keys, the keys to my house, so whenever I open and lock the door of my house, I remember about you, so thank you. Smitty: (Laughs.) Oh, that was so sweet. Thank you so much. You’re so welcome. Okay, so talk to me about how you first learned to play the saxophone. CM: I started playing the piano, really, and I was about eleven years old. In my house my father used to play it well, so we were really very much in a musical environment, so I grew up in that environment. My father used to play the guitar when he was young and so I have always had a piano in my house, and my dad has always loved jazz, Ellington, Sinatra, for example, Jobim, Count Basie, and so I started listening to jazz music since I was a child and then the saxophone had always been my sort of dream and so as soon as I started listening to saxophone music in the recorded version, I decided that I wanted to start playing the saxophone, but I couldn’t start playing it before I was sixteen because I suffered from asthma, a strong kind of sort of asthma, so I couldn’t play it, so that’s why I couldn’t start training on the saxophone. But later on my dad gave me a saxophone on my sixteenth birthday and from that moment on I never stopped playing it. And then I took my diploma in clarinet at the State School of Music in my hometown in Salerno, but I’ve always preferred to play the saxophone rather than the other instruments. Smitty: Oh, wow. That’s fantastic. And you are such a strong sax player now! So do you remember your first professional show? CM: Yes, it was here in my hometown in Salerno and I played and performed in a jazz club in my hometown. Smitty: Very cool. So talk to me about this wonderful band. I just enjoyed listening to them. They’re just fantastic players. Talk to me how you met them and what they mean for you and your music. CM: They were people who I met first of all as friends and then as music players and so there is a very strong link among us that goes beyond music and professional performances. We have been playing together since the first CD was released, Trane’s Groove, but I had already met them a long time before and we had already played together before being a band, so we had already met before and played together before this project we have now where we are sharing. CM: And among us there was a very strong feeling as far as music is concerned. As soon as I decided to create this band and follow this path, they were really enthusiastic to join this group and that’s why we could work together in good harmony and do rehearsals and work on different pieces of music because moreover we live in the same town and that helped us to work together. That allowed us to grow together as a band and work and do rehearsals and exchange ideas and stimulate each other and learn from each other’s own experience because we usually go out together apart from being in the same band and we get along well as friends, we meet up and go out in the evenings, so this strong, friendly relationship gives something more to music and helps us improve our style and our music.